Climate change and communication will be the focus of a panel discussion on Jan. 31, hosted by the Department of Communication Studies at York University. 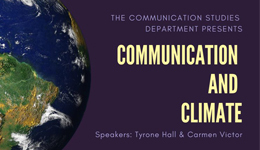 The event will feature guest speakers Tyrone Hall and Carmen Victor, both PhD candidates in Communication Studies, who will explore the topics of climate change and environmental communication. This panel will be held on Thursday, Jan. 31 at 11:30 a.m. in Room 3060, Victor Phillip Dahdaleh Building. Everyone is welcome to attend. Victor is a PhD candidate in the Joint Graduate Program in Communication & Culture at York/Ryerson universities. Her writing on contested landscapes, installation art, cinemas of the circumpolar North, and time-based and experimental film and media has been widely published. She teaches in the Faculty of Liberal Arts & Sciences and the School of Interdisciplinary Studies at OCAD University. Victor will discuss that catastrophic climate disaster is no longer a question of “if,” but is now a questions of “when.” The recent United Nations Intergovernmental Panel on Climate Change report affirms that there are only 12 years to implement drastic changes to mitigate extreme heat, drought, floods and poverty caused by an increase in the Earth’s warming beyond 1.5 C. In the face of political stagnation, students and scholars in the social sciences and humanities often wonder how to address climate change. Victor will address how the imaginary has been a common horizon that grapples with climate catastrophe, as well as developing upon the idea of a “visual culture of the Anthropocene” to unpack subjectivities of the (so-called) Anthropocene. Hall is a Vanier Scholar and PhD candidate focused on environmental communication. His ambitious global dissertation project aims to optimize climate change communication through field work in 17 traditional and Indigenous communities across Fiji, South India and Belize. He has close to 10 years of experience managing environmental communications in the Caribbean, including three years as the lead communications specialist for the Caribbean Community Climate Change Centre. He also routinely reviews climate change communication and information and communication technology for agriculture and youth employability initiatives in India, Sub-Saharan Africa, the Caribbean and the Pacific. During the event, Hall will discuss how contemporary society is confounded by the unprecedented nature of current and projected climate change and variability. While there is broad technical and scientific consensus for urgent changes in global economic and energy systems, policy-makers have struggled for more than a generation to effectively mobilize the scale of agency and action needed to support these actions. The belated adoption of a common “rule book” on the eve of the implementation of the Paris Agreement is the latest indication of the action gap. What does a sociocultural perspective offer for improving the communicability of climate action during the enactment of systemic climate actions? How should the sociocultural be leveraged and what are its limits? For more details, visit the event listing at events.yorku.ca/#event|communication-and-climate-change|77773.